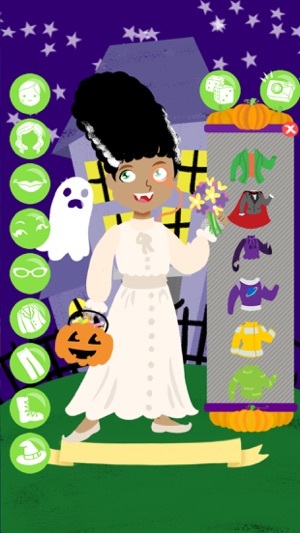 Get ready for some haunted Halloween fun with Halloween Costume Party Dress Up! 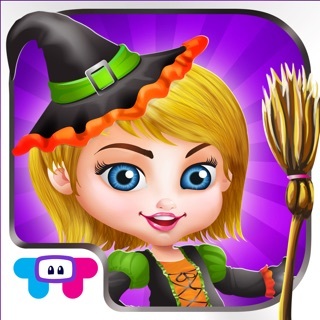 Your kids can dress up in lots of fun costumes- vampires, witches, robots, Frankensteins and monsters are all included for a crazy Halloween adventure! 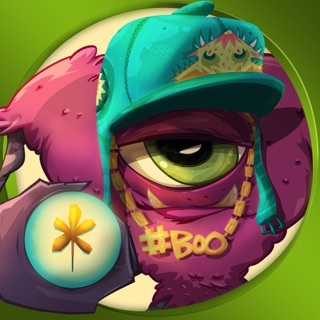 Girls will have hours of spooky fun with this app. 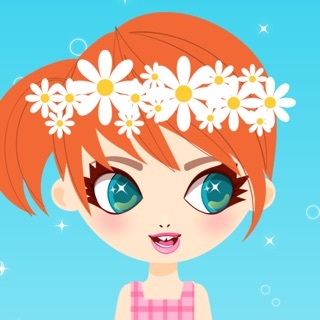 Kids can make the trick or treating dress-up doll look just like themselves- select custom hair colors and styles, as well as custom skin and eye colors. 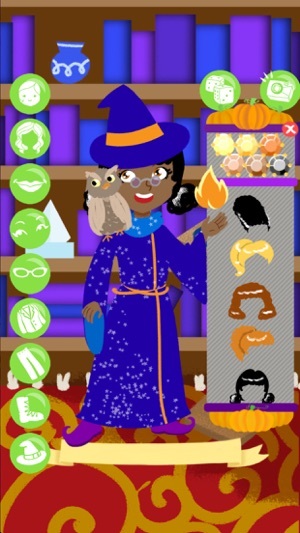 Then choose from your favorite character costumes and make the coolest Halloween costume ever! 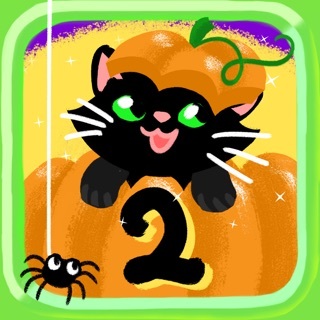 Kids can choose a matching costume with tops, bottoms, hats, gloves, shoes, accessories and candy buckets, then complete the look with a themed pet (lots of black cats and bats!) 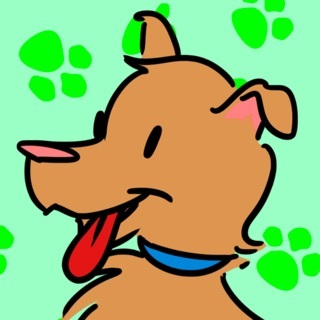 and a background. Or go crazy! 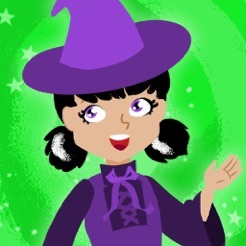 Children can mix and match costume ideas- what about a witch from space, a panda bear pirate or a vampire fireman? A dice button is included to randomly shuffle different looks together- the possibilities are endless! 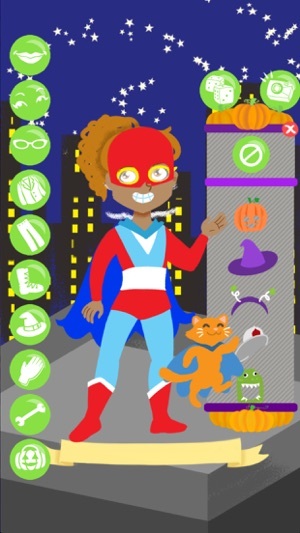 After creating a customized Halloween outfit, kids can save a screenshot to the device’s photo album. 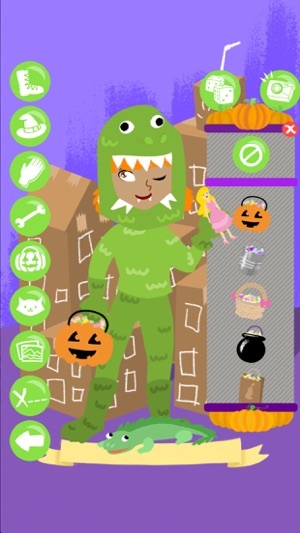 Nothing scary is included in this game, just good clean holiday fun- join the Halloween Costume Party today! 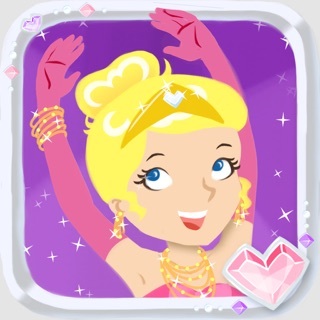 -Game is for boys and girls ages three and older. 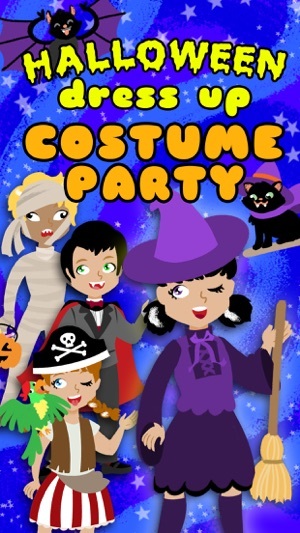 -Includes 19 costumes with tons of accessories, dressed-up pets and 15 different backgrounds. -Bright and colorful graphics by children's book artist Laura Tallardy. -Available in 11 languages: English, French, Russian, Spanish, Danish, German, Italian, Portuguese, Dutch, Korean and Swedish. -Internet connection not required to play. -Does not contain links to social networks. -Does not use data collection tools. 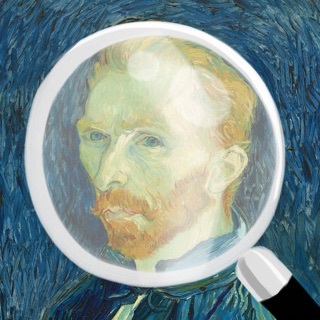 -Contains links to developer's other apps. 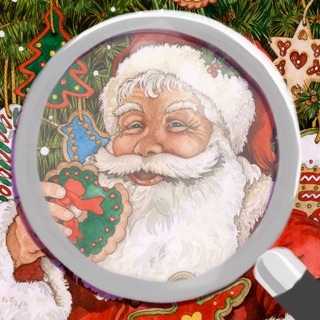 Contains a limited amount of free content with an in-app purchase to unlock all items in the Parents page. 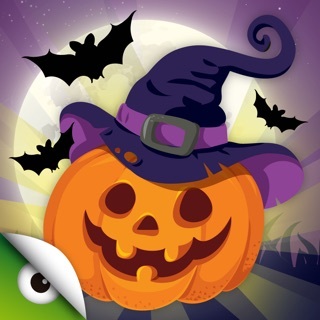 Very nice dress up app getting ready for halloween. Kids love it. So many options to choose from to make character unique. Looks great! 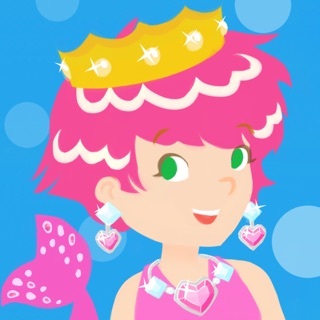 My daughter is fond of dress-up games. 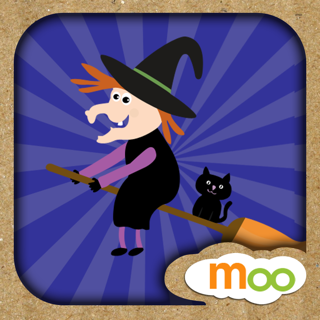 This one is a favourite for Halloween! A good selection of Halloween costumes to keep kids engaged.